Polish cuisine, like that of many central European countries, makes heavy use of meat and poultry, which is often served with potatoes, rice or cabbage. However, because of the Baltic coastline and many inland lakes, fish is also popular, with trout and herring acting as local favourites. Around Krakow, in throughout the south, local forests yield a bounty of quality game (wild boar, goose, and venison a plenty). The legacy of former rule by Austria is also evident here, especially in Krakow’s love for sophisticated cakes and pastries. I explored Polish cuisine for the first time via Krakow’s creative culinary scene. Top restaurants in town serving classic dishes along with inspired contemporary takes on the traditional include Sheraton Grand Krakow, Pod Nosem, Pod Baranem, Wesele, and Szara Ges w Kuchni. 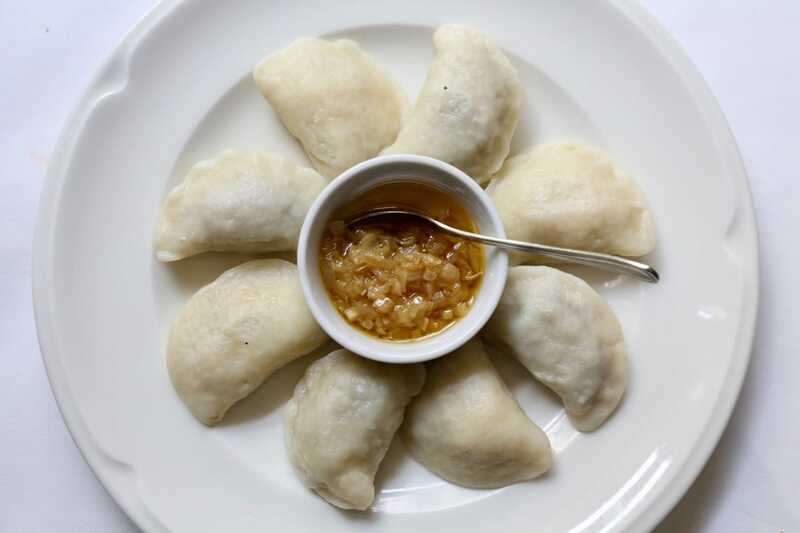 Pierogi are Poland’s most ubiquitous food stable. These ravioli-style dumplings are boiled and may be stuffed with meat, sauerkraut, mushrooms, cheese or fruit. 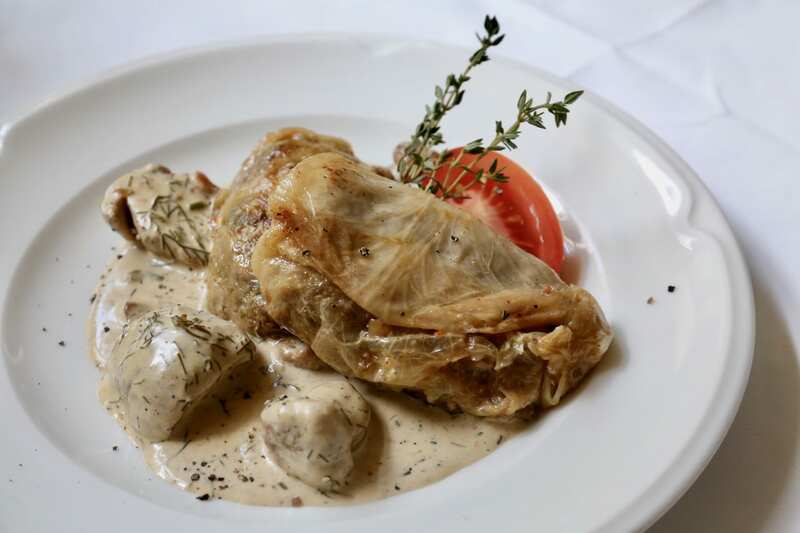 Cabbage Rolls (known locally as golabki) are traditionally served stuffed with rice and topped with sweet tomato sauce. My favourite variety arrived smothered in dill cream and mushrooms. 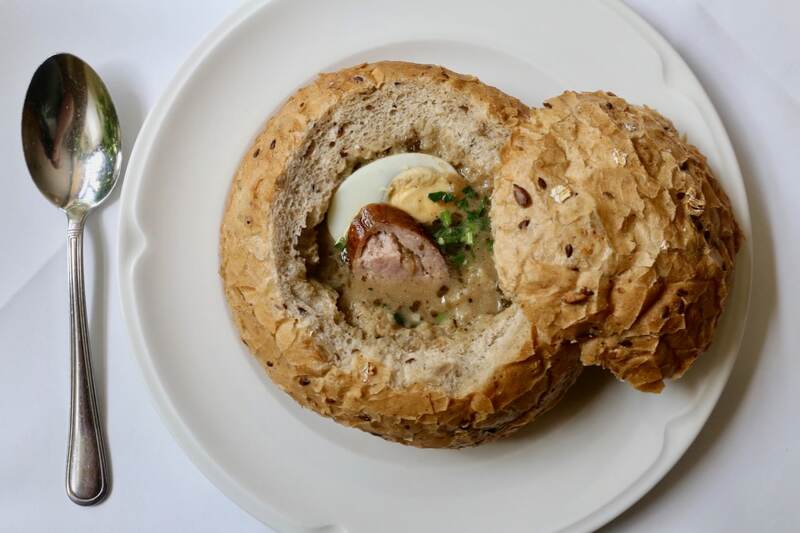 Polish people love soup and my favourite iteration was Zurek, a hearty kielbasa and egg soup served out of a bread bowl. 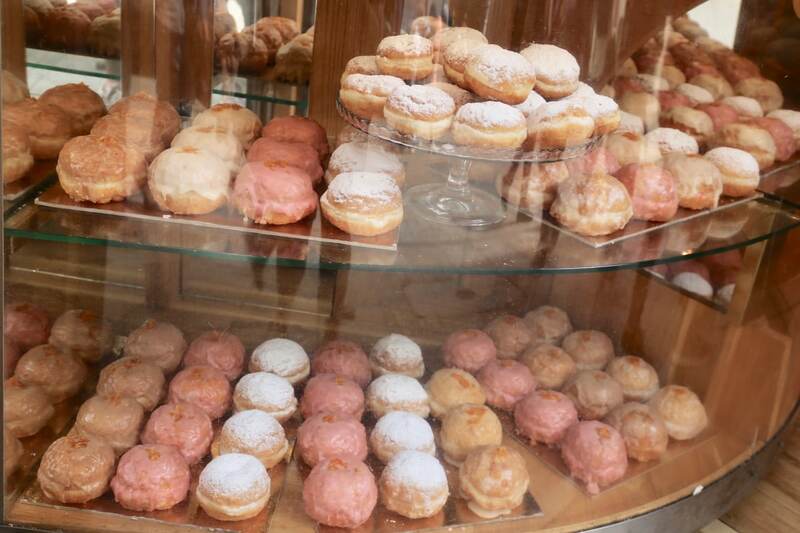 Paczek (Polish donuts) are served in bakeshops and cafes across the country. The balloon shaped sweet snacks are traditionally filled with flavoured cream or fruit jelly and topped with glaze or a light dusting of icing sugar. 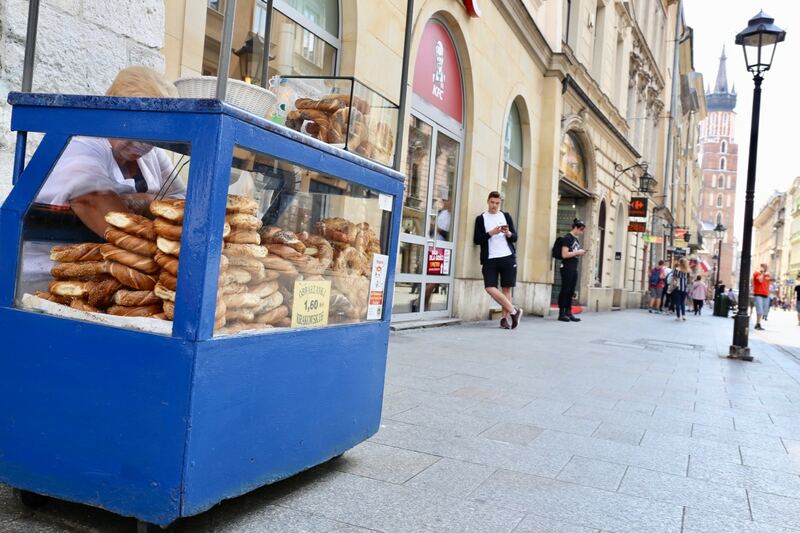 Obwarzanki (Polish pretzels) are a favourite street snack, sold freshly baked each morning at train stations, bus stops, and on the corner of busy city streets. 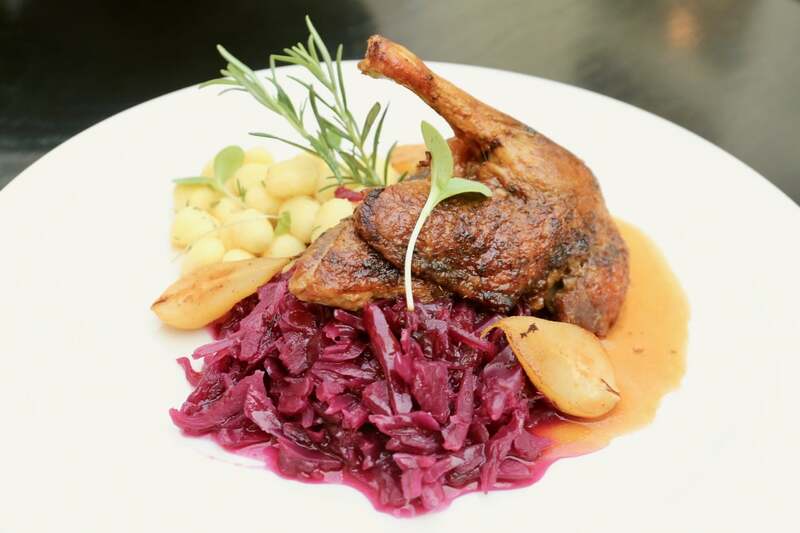 Roast Duck is a classic Polish entree typically served with with pear or apple, braised cabbage, and kopytka (Polish potato dumplings similar to gnocchi). 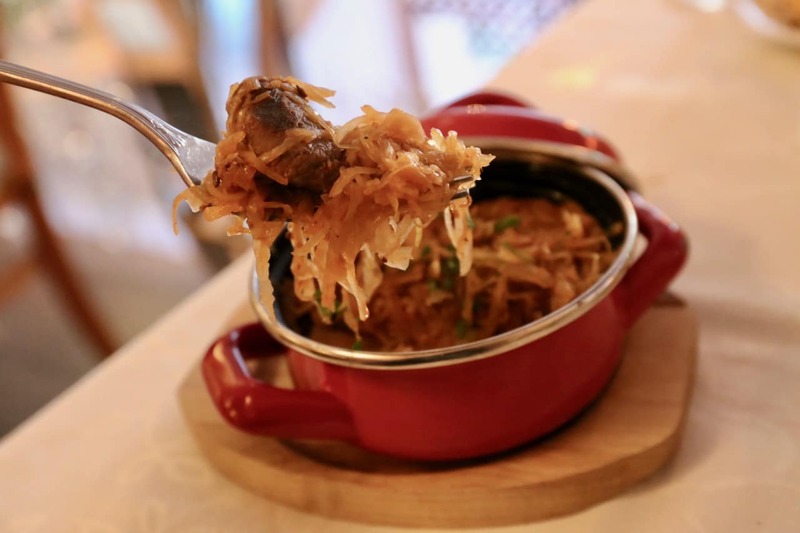 Bigos is Poland’s national dish, a hearty meal featuring chunks of meat and sausage which are simmered with sauerkraut, cabbage, onion, potatoes, herbs and spices. 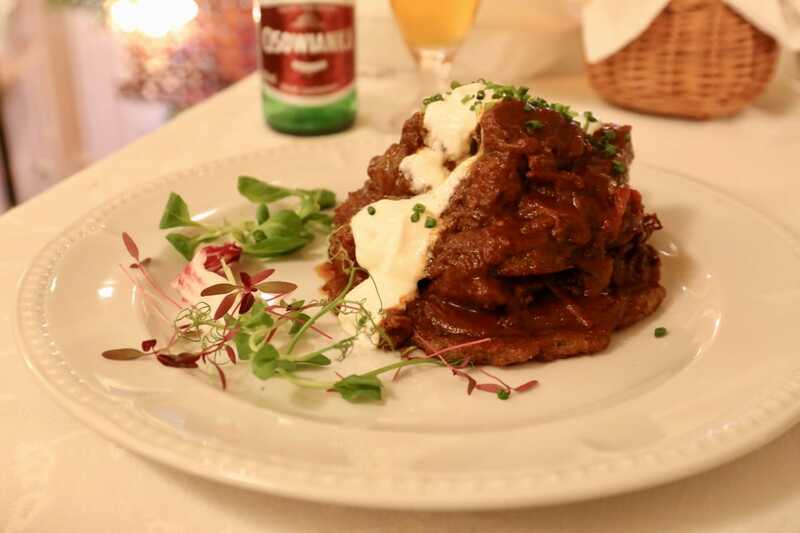 Potato Pancakes with Goulash (known locally as Placki Po Wegiersku) is a Hungarian inspired dish featuring crispy griddle cakes topped with beef goulash stew and sour cream. No trip to Poland is complete unless you’ve enjoyed lunch at a traditional Milk Bar. These ex-Socialist era workers canteen’s still serve locals government subsidized Polish eats. Krakow has the distinction of being the birthplace of the Milk Bar, with its first opening in Market Square on May 30th, 1948. Run by the government, this was the Party’s ‘clever’ attempt at popularizing milk-drinking (as opposed to moonshine), inspired by Poland’s large surplus of dairy products. As restaurants were nationalized by communist authorities, more and more Milk Bars appeared with the Party concept being to provide cheap, dairy-based meals to the masses. In addition to milk, yoghurt, cottage cheese and other dairy concoctions, Milk Bars offered omelettes as well as flour-based foods like pierogi and cheese stuffed crepes. Today Milk Bars are frequented by every slice of society, from the homeless to retirees, students and bankers. 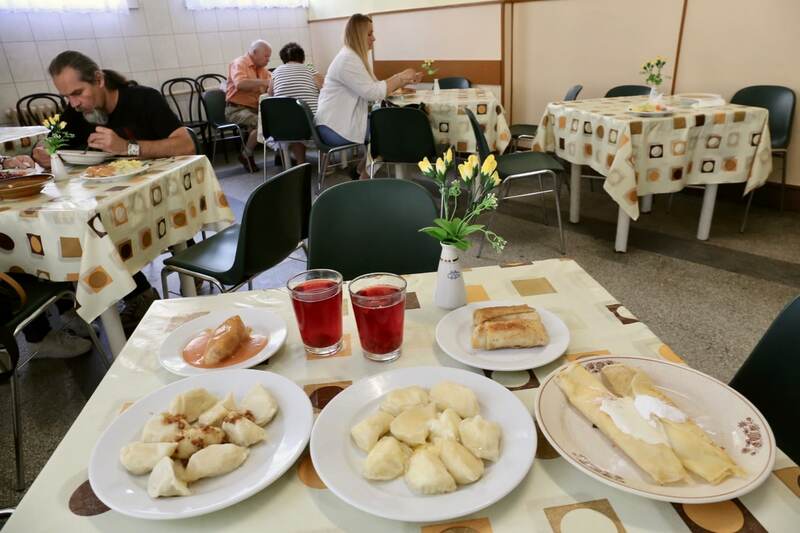 While prices are the lowest in town (you’ll pay USD $1 for ten pierogi), the food served here will satisfy your comfort food cravings as everything is made lovingly by Polish babcias. 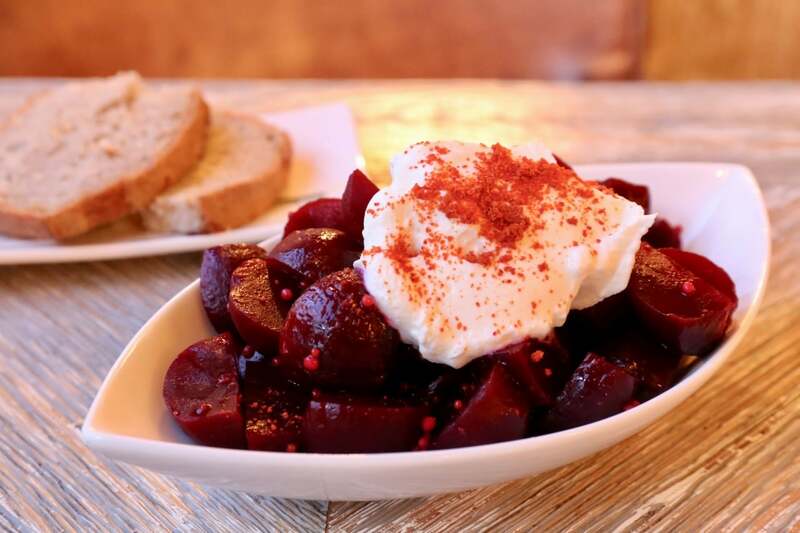 Sweet beets are a local favourite in Poland are can be found served as a lemon and garlic scented soup (Barszcz) or simply served marinated in mustard seed and horseradish and topped with creme fraiche. Sipping vodka distilled from potatoes or grain is everyone’s favourite Polish pastime. 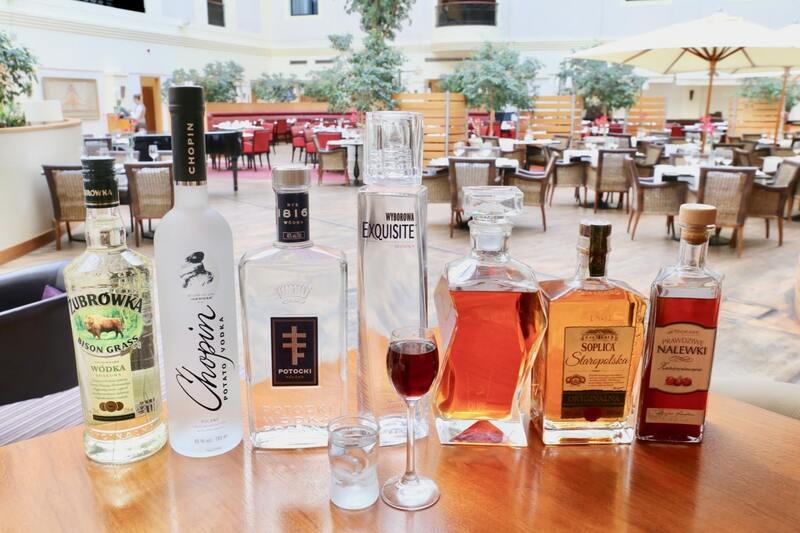 Such brands as clear Wodka Wyborowa and dry Zubrowka (flavoured with bison grass) are world-famous though the number of vodka brands produced here is bewildering. Other popular spirits includes Wisniowka (cherry vodka) and Zoladkowa (an amber-coloured vodka flavoured with herbs and used as a digestif. Polish breweries have developed rapidly over the years and there are plenty of local craft options if you’re tired of slugging pints of Poland’s most recognized lager Zywiec. 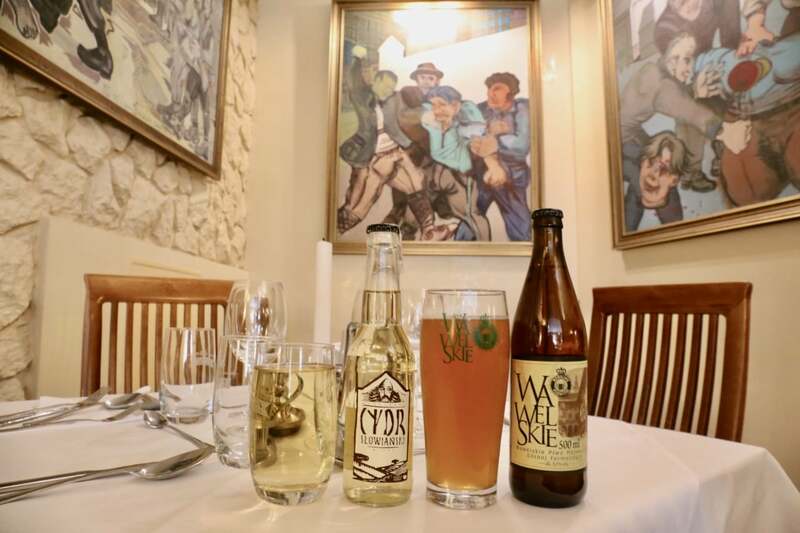 Most restaurants and bars also offer bottles of apple and plum cider which are delightfully quenching on a hot afternoon.